Drawing from vast Italian culinary traditions, Edendum is the latest independent venture to join the Brighton eating out scene. Set up by northern Italian natives Diago and Lorenza, their background story is by definition ‘authenticity’ at its finest. 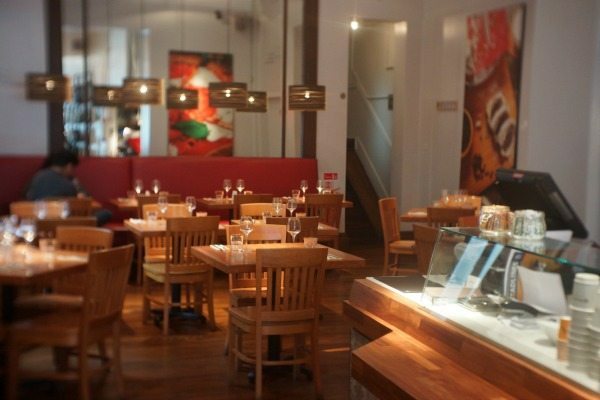 Despite there being a wealth of Italian restaurants in Brighton, Edendum promises to offer a different kind of experience, serving niche delicacies ‘without giving up the classic dishes that everybody loves’. 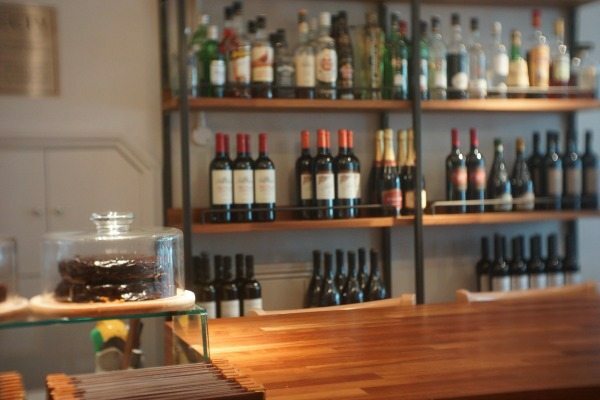 Priding themselves on offering find food around the clock, Edendum is not just an evening bistro, but also a cafe, and a food shop – selling fresh produce and wine shipped from Northern Italy. On a sunny Thursday afternoon, we were invited along to try their new summer lunch menu. Located in the buzzing lanes on East Street, we were warmly greeted by our Italian waiter Raúl. The decor is clean and classic with an array of glistening wines and dry goods lining the walls. Two large windows dominate the front of the restaurant, which can be opened in warm weather – similar to a bistro in the heart of Italy. With another couple sat ahead enjoying some afternoon food, and a larger party nearby – the ambiance felt relaxed, happy and inviting. As we inspected what the lunch menu had to offer, Raúl suggested we sample a popular choice of their red and white wines first – confident that it was of good quality – it was an offer we couldn’t refuse. 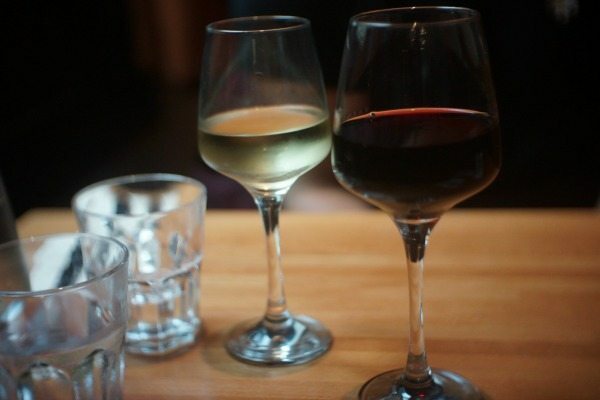 My partner went for the white Grillo Erice Aegades – a luxuriously smooth wine balanced with hints of exotic fruits, and I went for the red Vignaruja, described as a smooth full bodied intense ruby red. With both fine wines poured, it tasted absolutely exquisite and set the bar high for the rest of the meal. The summer lunch menu consists of a glorious selection of Italian specialities offering two courses for £11.95 and dessert for an extra £3.00. With a range of pastas, gnocchi, pizza, salads, meats, fish and vegetarian options to choose from – we were spoilt for choice. For starters I opted for the Salmone Marinato alla Vodka – homemade marinated salmon slices with Vodka and black peppercorn served with courgettes in extra virgin olive oil (At first I felt slightly sceptical having more alcohol at lunch, but you only live once right?). My partner chose to have the Focaccia con olio all’aglio – home-made flatbread with garlic, evoand mozzarella cheese – because ‘authenticity’ goes hand in hand with anything ‘homemade’. The presentation was impeccable. The salmon, placed under the curly green courgettes, sprinkled with the black peppercorns, and drizzled with the sauce looked beautiful. 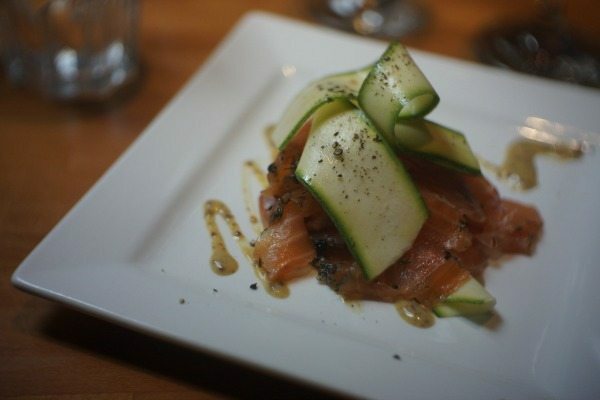 The salmon was tender, and partnered well with the crisp of the courgette. The kick of the vodka was subtle but combined favourably with the freshness of the olive oil. Such a simple dish done to the highest standard possible, which speaks volumes about the quality of ingredients and culinary skills. 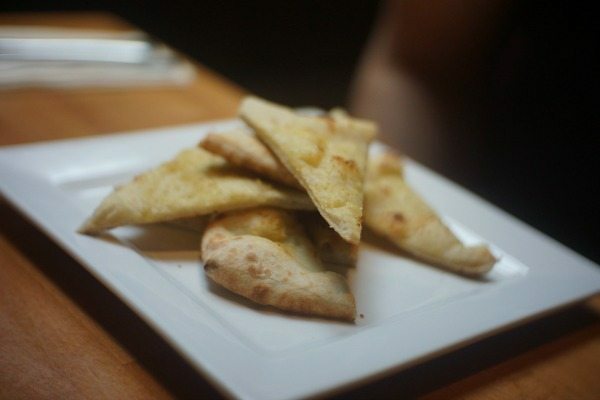 Equally, my partner’s flatbread was fresh, crispy and full of aromatic flavour. Traditionally vegetarians have a lack of choice, but Edendum offers a fine selection of non-meat and also vegan options, which meant my partner (who is vegetarian) was in awe, and spent a little longer than usual choosing his dish. After some deliberation, he went for the Gnocchi freschi con pomodoro S. Marzano, basilico e parmigiano – home-made gnocchi with S.Marzano tomato sauce, basil and parmesan cheese, and I went for a meat option – the Picatta di pollo – poached chicken legs rolls with pancetta and sun-dried tomato. After the excellent starters, my expectations were high for our mains. As both dishes were presented on the table, again the arrangement was divine and the colours were vibrant. The chicken is soft succulent and adorned with small crispy pieces of pancetta, finished with a fragrant sauce. The combination of flavours complemented the dish to perfection – and the crispy pancetta added texture to this simple but wonderful dish. I couldn’t help but sample the flavour slowly, trying to get every bit on the fork, washing it down with a sip of fine wine. If you’re searching for an indulgent lunch – look no further. 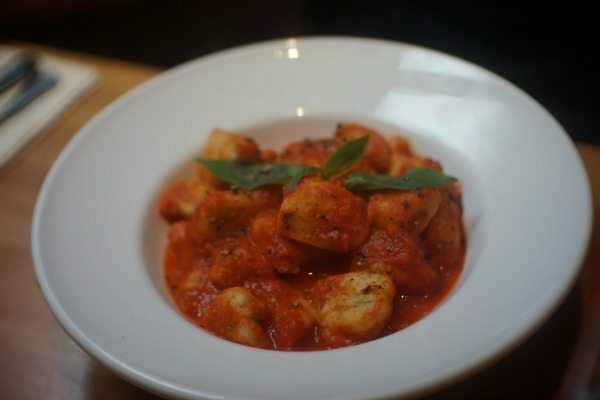 My partner’s gnocchi looked and smelt delightful – so much so, that I had to sample some. 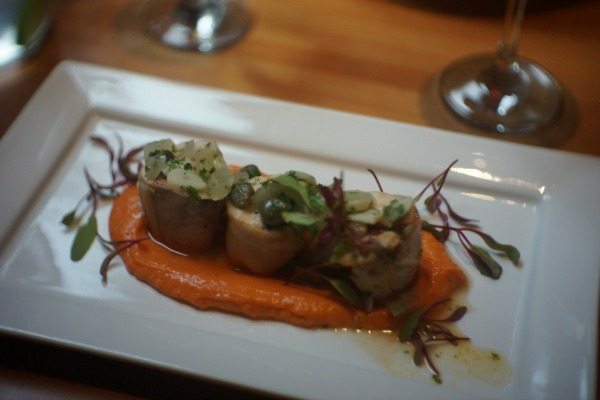 It was delicate, light and enriched with a punchy taste of tomato and freshness of the basil. It defined home-made and it couldn’t have tasted more like Italy if they tried. 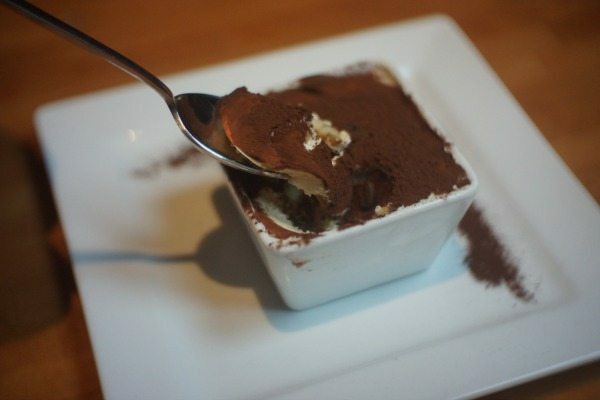 Raúl proposed that we try a dessert – and without hesitation we agreed to try their tiramisu (we were certainly in the right place for it). The dessert looked exquisite, dusted with cocoa, and enough to feed us both. Fresh, light, soft and creamy in one mouthful. Not too rich, but with just enough sweetness – and quite frankly one of the best desserts we had both tried in a long time. The portion size was perfect for a lunch – with finished plates and empty glasses, we were extremely content. Raúl mirrored our smiles as he came to ask how the food was – we were two very satisfied customers, and went on to thank him for the wonderful service. Edendum writes that it aims to offer ‘an italian eating experience, made of the authentic flavours and culture of our homeland’ and without a doubt, this is exactly was it offers. Diago and Lorenza’s passion for delivering authentic quality food clearly shows – and without the hefty price tag! Every dish is made with love and care, reflected by the quality of ingredients, and the skills and passion of the staff. It’s a real taste of Italy, and I am confident that anyone who goes will understand why. If you’re looking for fine quality food, and an indulgent lunch experience (without the expense) – I highly recommend trying Edendum’s lunch menu for a work meeting, a romantic afternoon meal, or just a relaxed break with friends – you won’t be disappointed!